While on a pilgrimage to Bethlehem in 1371–72, Saint Bridget of Sweden (1302–1373) had a vision of the Nativity of Christ. Her description of this vision became a popular subject in Italian paintings. 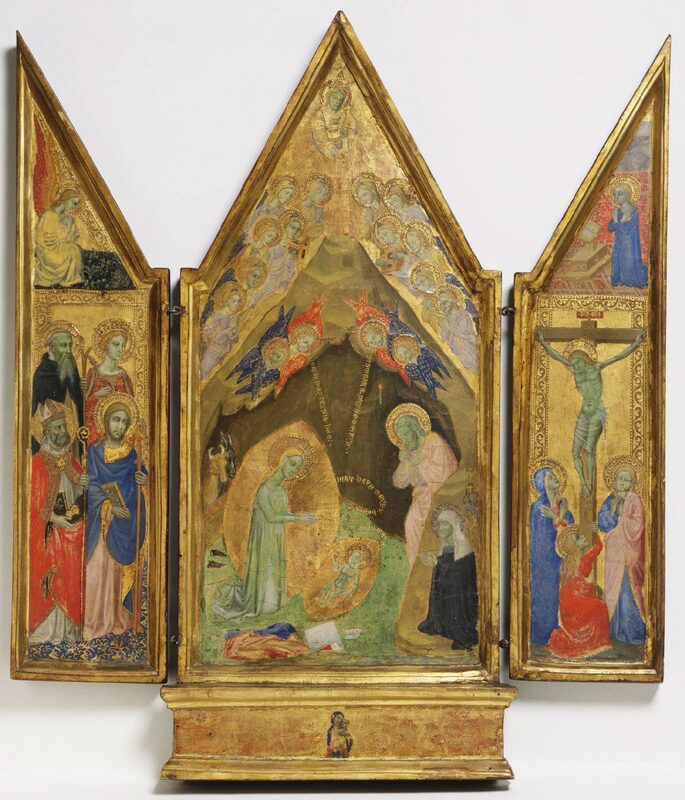 This Florentine artist probably met Saint Bridget in Naples around 1372. He depicts her in prayer in the lower right corner of the central panel. There are four saints in the left wing: Anthony Abbot, with a walking stick; Catherine of Alexandria, with a crown, a martyr's palm, and a spiked wheel; the bishop Nicholas of Bari, with the three golden balls that he gave to an impoverished gentleman for his daughters' dowries; and James Major, with a pilgrim's staff. Above, the Annunciate Angel Gabriel kneels in a green meadow. In the right wing there is a scene of the Crucifixion with the mourning Virgin and John the Evangelist, and Mary Magdalene embracing the cross. Above, the Virgin Annunciate kneels before a lectern. The center section shows the vision of the Nativity of Saint Bridget of Sweden (1302-1373; canonized 1391), who kneels in prayer outside a grotto. She has a rayed halo and wears a black habit and white veil; a pilgrim's canteen hangs behind her. Inside the grotto, the Virgin kneels in adoration of the Christ Child. Her long blond hair is loose, and her mantle and shoes lie around her. Jesus is naked, but his swaddling clothes are on the ground in front of him. Joseph, folding his arms across his breast, is about to kneel. Rays of light form golden mandorlas around Christ and the Virgin, and a candle illuminates the back of the dark grotto. Two seraphim and two cherubim hover at the opening. God the Father, wearing a triangular crown and accompanied by a heavenly host, looks down from above. Inscriptions emanate from him, the Virgin, and the two seraphim. Immediately after her vision, Bridget dictated it to secretaries, who translated her account from Swedish to Latin. She returned to Rome via Naples in February 1373. By March she was in Rome, where she died in late July. At the time of her death, her principal secretary, Alfonso Pecha di Jaén, was in Avignon, bringing the last of her visionary revelations to Pope Gregory XI de Beaufort. In 1375 Alfonso began working on a final text of all of Bridget's visions. It was finished in early 1377, when the canonization process was officially initiated. Alfonso's personal copy of the revelations (see New York, The Pierpont Morgan Library, M.498, folio 4 verso) was illuminated by a Neapolitan painter in these same years. In a letter written on January 15, 1378, Alfonso remarked on the many requests he received for copies of her accounts.2 His letter contains a postscript written by Bridget's daughter Karin Ulfsdotter, in which she comments on the many images of her mother that existed in Italian churches; she noted that even the pope kept one in his bedroom. Four portraits of Bridget were known to exist in Neapolitan churches.3 When Bridget was canonized in 1391, a Neapolitan pope, Boniface XI Tomacelli, was in office. Niccolò di Tommaso's triptych in the Johnson Collection shows Bridget with the rays of the beatified, indicating that it was made before her canonization. This is also the case with two other paintings by Niccolò, one in the Pinacoteca Vaticana (see Vatican City, Pinacoteca Vaticana, no. 137 (172)) and the other in the Yale University Art Gallery, New Haven.4 Of the three, the Johnson picture is the most important. Orsini is also a good candidate for the original owner of the Johnson triptych. Not only would he have known Niccolò through Del Balzo, he was an ardent supporter of Bridget, and his name saint-Nicholas of Bari-is in a position of honor in the left wing. Niccolò di Tommaso himself may have met Bridget on any number of occasions in Naples, where she had lived from 1365 to 1367 and again from November 1371 to early March 1373, briefly stopping there also on her return from Palestine in February 1373. Carl Brandon Strehlke, from Italian paintings, 1250-1450, in the John G. Johnson Collection and the Philadelphia Museum of Art, 2004, pp. 342-345. 1. Hendrik Cornell. The Iconography of the Nativity of Christ. Uppsala Universitets Årsskrift. Uppsala, Sweden, 1924, pp. 11-13. 2. Carl Nordenfalk. "Saint Bridget of Sweden as Represented in Illuminated Manuscripts." In De Artibus Opuscula XL: Essays in Honor of Erwin Panofsky (vol. 1, pp. 371-93). Edited by Millard Meiss. New York, 1961, p. 379. 3. Nordenfalk 1961, p. 381. 4. No. 1943.236; Charles Seymour, Jr. Early Italian Paintings in the Yale University Art Gallery. New Haven, 1970, fig. 45. Both works are rectangular. The one in the Vatican was the center of a triptych. Offner (Richard Offner. "A Ray of Light on Giovanni del Biondo and Niccolò di Tommaso." Mitteilungen des Kunsthistorischen Institutes in Florenz (Florence), vol. 7, nos. 3-4 (July 1956), p. 192) proposed that two other paintings also in the Vatican (inv. 212, 219; Francesco Rossi, ed. Catalogo della Pinacoteca Vaticana. Vol. 3, Il trecento: Umbria, Marche, Italia del Nord, con un'appendice sui toscani. Monumenti, Musei, e Gallerie Pontificie: Reparto per l'Arte Bizantina, Medioevale, e Moderna. Cataloghi. Vatican City, 1994, figs. 31-32 [as Policleto di Cola? ]), showing Saints Anthony Abbot and John the Baptist in one and Saints Julian and Lucy in the other, were the side panels. This thesis has been rejected by Volbach (Wolfgang Fritz Volbach. Il trecento: Firenze e Siena. Catalogo della Pinacoteca Vaticana, 2. Italian translation and iconographic revision by Francesca Pomarici. Vatican City, 1987, p. 26). The painting in Yale was probably also part of a triptych. 5. Cornell 1924, p. 15. 6. The triptych is on deposit at the Museo e Gallerie di Capodimonte, Naples; (Ferdinando Bologna. Novità su Giotto: Giotto al tempo della cappella Peruzzi. Saggi, 438. Turin, 1969a, vii-78-79, figs. 101-3). 7. Pompeo Litta. Famiglie celebri italiane. Issued in parts. Milan, 1819-85, Del Balzo, genealogical table xi. 8. It depicted Saint Peter Celestine V enthroned with his monks, other saints, and Del Balzo and his wife as donors (F. Bologna 1969a, vii-80-82, figs. 104-10).